Ford Motor Company's Silverton Assembly Plant in Pretoria has reached a significant milestone with the assembly of the 500 000th current generation Ford Ranger. The half-millionth unit, a Wildtrak 3.2 Double Cab, was fittingly painted in the range-topping model's distinctive and exclusive Pride Orange, and according to the brand, "signifies the Ranger's segment-defining legacy since production commenced in 2011". 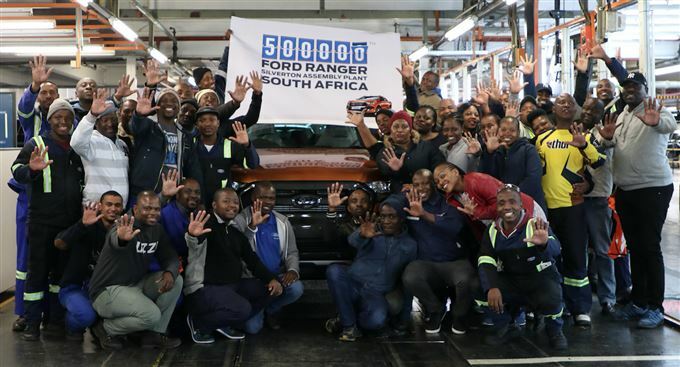 "The current Ford Ranger has been a remarkable success story for Ford Motor Company of Southern Africa, and we are delighted to have reached the 500 000 mark for this vehicle programme," said Ockert Berry, VP Operations, Ford Middle East and Africa. "Ford invested more than R3-billion in our local operations for the launch of the Ranger in 2011 to cater for the South African market and exports to over 148 markets in Europe, the Middle East and Africa. We followed this up with a further R3-billion investment in 2017 to further expand our production capacity to meet the growing worldwide demand for the Ranger." "This reaffirms our role as an integral part of Ford's global manufacturing network with world-class operations at the Silverton Assembly Plant in Pretoria, and at the Struandale Engine Plant in Port Elizabeth which produces the Duratorq TDCi engines for the Ranger." Ford adds that the traditionally long model cycles associated with the LCV segment have been slashed with the Ranger, as regular feature and equipment upgrades over the past seven years have ensured that Ford's pick-up range remains at the top of its game. Most notably, the Ranger received a comprehensive update in 2015 that saw the debut of even more muscular styling, along with technology and feature enhancements that included SYNC®3 and the subsequent addition of embedded navigation on high-spec models. Records continue to be broken in terms of export volumes, with a truly impressive 8 062 units being shipped from Silverton to customers in Europe, the Middle East and Africa in April 2018. Combined local and export volumes for the month topped out at a record-breaking 10 434 units, making the Ranger the highest volume LCV model produced in South Africa - by a significant margin. "Early next year we are set to launch the first-ever Ford Ranger Raptor, which will add an exciting new chapter to the Ranger's proud legacy in South Africa and across the region," Berry concluded.